Aloha & Welcome to the Island with Rainbows!!!!! I also received game Roos and Hens. A lot!! My grandfather was from the Philippines and yes raised that kind of birds, Game Fowl. 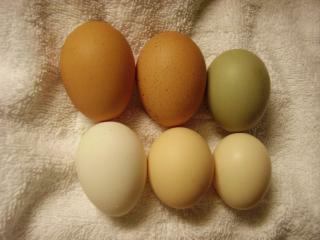 My flock grew from that to other types of chicken Breeds. I also had all my tame game Roos stolen, my Grandpa's too. :-( I told myself I am never having game Roos cause they may get stolen again. 2) Game hens (Caught, Received and or Produced) 01/5/2011 Selling all of these slowly. 6) Others/to be placed: RIR, Golden Spangled Humburg, Japanese Banty etc.. I have mapped the Breeding, eggs collected on the daily and also other things on my computer. My birds are treated with feed, range, and table scraps. ( My feed store says I spoil them.) I learned more about breeds from experience and friends. As I got into the book reading I noticed I still have a lot to aquire, but learning fast. I definitely like genetics cause it has produced some handsome chooks in my flock. (That is what I think at least.) As they say you never stop Learning. But thanks to this site I have great teachers!